Tartan red with black leather seats piped red and black carpets. We sold this very pretty B in 2014 and it has returned to the fold having been ousted by a TR4a, the poor thing. MK1 MGBs have a lovely period feel about them and really are an enjoyable classic sportscar being easy to use and maintain. 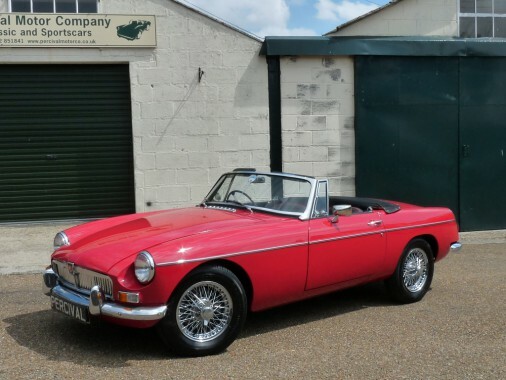 In excellent condition throughout, this lovely MGB comes from a long time customer of ours. It features chrome wire wheels, an overdrive gearbox, a full tonneau, an alloy rocker box, a Kenlowe electric engine fan and the cylinder head has been converted for unleaded petrol. The bodywork was thoroughly overhauled in 2008 and remains in immaculate condition with a beautiful paintwork finish. It has covered under 6,000 miles since. The interior has had ongoing care including new carpets, a new windscreen frame and a replacement hood with a refurbished frame. The seats are unmarked. In 2013, the engine was removed and the engine bay repainted to the same high standard of the exterior finish and everything was then cleaned and detailed where necessary and re-fitted. It is in beautiful order. Since we sold the MG it has been treated to lots of detailed work including a new boot carpet set, new brakes fornt and rear, new seat belts, a strip and overhaul of the dashboard, a new timing chain and associated seals, rebuilt seats plus numerous other jobs that the owner has enjoyed doing during his ownership. The car drives very nicely having been well maintained and cared for over many years. There is a thorough history file going back twenty years. The car remains in the lovely condition that you see.